A newscaster aware of violence against Asians, emotionally distances herself from it. She doesn't want to be thought of as stereotypically "Asian," but only as American. Then one night, through a series of dreams, she becomes some of those "images," and experiences the humanity of each one. In her dreams, she becomes: A bar girl prostitute in Saigon during the Viet Nam war; a Filipino woman being interviewed on video as a potential mail-order bride; a little girl caught in the bombing of Hiroshima, running and running to no where; a Nisei woman (2nd generation Japanese American) who as a child, was imprisoned in the internment camps in America during World War II, learning to stand up for herself; a Cambodian woman adjusting to her new life in America; and a teenage troublemaker from a family of high achievers, constantly fighting. Through her karate master and her grandfather, she realizes she has been fight herself. Fighting to be seen. To be not invisible. The woman awakens to the understanding that we are all part of each other, and to deny someone their humanity because they look or sound different, is to deny the humanity in ourselves. She is able to embrace her own personal heritage--that of being Japanese-American. She now sees in her own reflection, the face of her mother, her grandmother, and also these other Asian women from other countries, that she thought were so unlike her. And she understands that despite all the differences that exist between people--skin color, languages, culture--in the end, we are all the same. We are the mothers, fathers, sisters, brothers, lovers, and children of the earth. STORIES WAITING TO BE TOLD celebrates Asian and Asian American women, past and present, some of whom are Japanese, Chinese, Korean, and Cambodian, as they redefine themselves within the American dream. The first generation women remember their homeland as they build their new lives in America. Other Asian American women struggle with issues that are not often discussed within their communities or even families. The second- and third-generations deal with contemporary America; the opportunities and the obstacles. Miyhan, a young Korean woman, goes to high school in America and is befriended by a black girl named Bernice who teaches her about jazz. A Cambodian woman adjusts to her new life in America, amazed at all the modern conveniences. However, her previous life comes back to haunt her in her dreams. A young Chinese American, who's always tried to blend in, learns some of the history of Chinese people in America. A "good wife" tries to understand the violence that permeates her married life. A woman struggles back from drug addiction, with the hope of seeing her young son again. A young lesbian learns the true meaning of love and finds peace in being herself. A Japanese American woman sees for a split second, the pain that remains in her mother from the internment camps. She also sees the strength and life force that comes from it. The women of STORIES, compelling in their vulnerability, are brought to life compassionately, with honesty, insight, laughter and love. Narita celebrates the differences and illuminates the universal similarities of us all. CELEBRATE ME HOME explores the many images that exist of Asian Americans in America. With both humor and drama, Narita examines how racism continues to be perpetuated in acceptable ways both in the media and socially. In the media racism is perpetuated by presenting stereotypical images over and over. And in social situations racist statements are thought acceptable if made with the addition of "But I don't mean you. You're different than all those other (fill in the blank)." This is aptly illustrated by two characters in CELEBRATE: A British actress creating an Asian character, but doing little research because "aren't Asians all alike? "; and a white woman who perpetuates racism through her "social chatter" at a party. How does growing up in a society where truthful images of yourself are not reflected back‹how does that affect one's feeling of self-worth with regards to personal and family relationships? How does it affect what one feels one deserves from Life? The Asian American women in CELEBRATE explore those questions and many more as: An woman in a relationship with a white man, is replaced by a younger Asian woman; a woman hears the call to be an artist; a successful rock 'n roll singer who becomes involved with drugs; a woman who always gets lost going to visit her Issei (first generation Japanese American) grandfather; a woman wonders what "family" means; and a woman sifts through memories of growing up, raising her own children, and surviving a broken relationship‹and tries to be zen about all of it. Celebrate Me Home is a hilarious and poignant dual journey thru the maze of racism and the mysteries of love – of a partner, family, and being an artist – to arrive with new understanding to places familiar and of the heart. WALK THE MOUNTAIN powerfully affirms the dignity, humanity and spirit of the Vietnamese and Cambodian people while examining the lingering effects of the Vietnam war, and the legacy of misinformation that exists in the United States about that war. 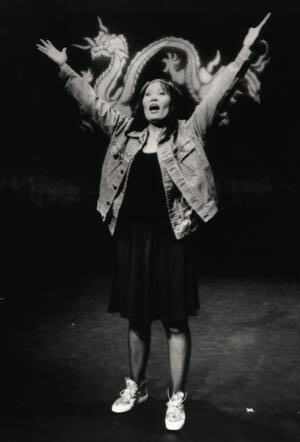 WALK THE MOUNTAIN is a one-woman play about Vietnamese and Cambodian women, and the effects of the Vietnam War (or as it's called in Vietnam—the American War) on the people in those countries. Thru it we can begin to see how history is distorted by the media and actually re-written by Hollywood movies. 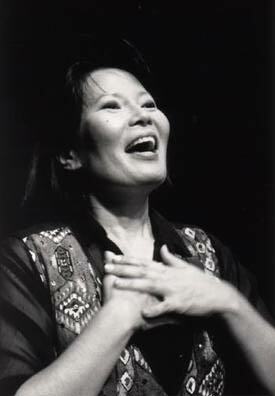 A woman faints during the second performance of WALK THE MOUNTAIN, and apologizes to Jude before leaving with paramedics, saying "I know all this information, I know it—but this way it just overwhelmed me". The humanity affected by U.S. bombing is kept from us. We may know some of the statistics, but they have no faces. In war, the enemy is purposely kept faceless. Without family. Portrayed as less than human. Having less feelings than us. Thus making it easier to kill them. This is a crucial and essential element of war, and can be felt and see to this day. In WALK THE MOUNTAIN we meet some of the "faceless enemy". A doctor working in the jungle hospitals, a freedom fighter imprisoned in a tiger cage, a mother searching for her sons, and an immigrant in America who dreams of flying are among the women in WALK THE MOUNTAIN. Inspired by her conversations and interviews with Vietnamese and Cambodian women, both during her trip to those countries and here in Los Angeles, Narita celebrates their lives—their joys and sorrows, their courage and bravery, and their dreams for the future. 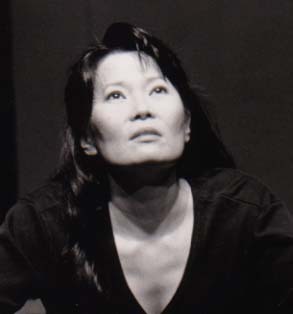 With Darkness Behind Us, Daylight Has Come - Jude Narita's latest work is a multi-media one-woman play about the effects of the internment camps on three different generations of Japanese American women in the Los Angeles area. An Issei (first generation) woman who struggles to build a family business; a Nisei woman (2nd generation) who believes in community, and writes newsletters to keep people in touch; a teenage Nisei angry at being in an internment camp; a Nisei activist; and a Sansei inexplicably drawn to buildings, who realizes through what hardship her grandparents and parents built their lives. Incorporated in the play is an original video of the Heart Mountain internment camp, with archival footage and photos from the 1940s of the camp; and also in the play are old family photos from three Japanese American families. Directed by Darling Narita. Lighting design by Jerry Browning. Live music is provided by George Abe. Both funny and sad, With Darkness Behind Us, Daylight Has Come is a moving theatrical experience.